Oh my gosh, The Goddess Hunt by Aimee Carter was one brilliant read. It was definitely the best novella I have ever read. I instantly fell back in love with the world of The Goddess Test, and was just as enchanted by it as I was in reading both The Goddess Test and Goddess Interrupted. I feel like we got spoiled with The Goddess Hunt. It is told from alternating points of views, Henry’s and Kate’s, and it was lovely. I just loved hearing from Henry because I love him as a character and he masks his emotions so much, that seeing into his head was really neat. I kind of hope now that we hear more from Henry in the future. The plot was a lot of fun. It was neat to see what Kate is getting up to in her six months “off”. The strong side of Kate’s character really comes across in The Goddess Hunt. There were some new characters that are introduced in this one, that it would be cool to see again, as they were quite interesting. So basically, The Goddess Hunt is an absolute must read. It was witty, charming, and all around awesome. Aimee Carter is such a talented writer, and now I will sit here and begin my wait for the next book. A Worthwhile Read for Fans of the Series! 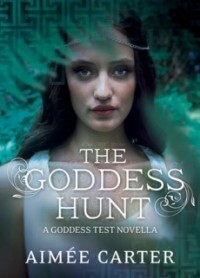 As a novella, The Goddess Hunt is actually very good. It has everything I look for in a novella – a story arc independent of the main series, a deeper glimpse into the characters, and a solid amount of content. But, while I found myself enjoying it for a novella, I did struggle to connect with some of the characters and thus, cared very little about the outcome. Taking place immediately after The Goddess Test, The Goddess Hunt shows Kate and James during their first day in Greece. I was immediately reminded of why I’m not a James fan, as he spends most of his time with Kate making her uncomfortable by flirting and dropping sexual innuendos that she repeatedly rebuffs after reminding him that she is now, and will always be, loyal to her new husband. He also purposely strays from their tour group in order to meet up with Lux (Pollux) and Casey (Castor), without informing Kate of his ulterior motives. It’s not long before they realize that Kate is now Queen of the Underworld, and all hell breaks loose. Fortunately for The Goddess Hunt, it’s told from both Kate and Henry’s PoVs and I was finally given some insight into the inner workings of Henry’s mind! After finishing The Goddess Test and jumping into Goddess Interrupted shortly after, I was desperate for a peek into Henry’s thoughts. I needed to see that he did care for Kate, and that he wasn’t letting his situation with Persephone taint their new relationship; he was just always so closed off that I was never able to truly understand what he was thinking or feeling. It was great to see him struggle with staying away from Kate, especially when she was so upset, and that he respected her enough to keep his distance and honour their agreement, however much it pained him to see her with James. It was also enlightening (and thrilling) to see that he was willing to change and to forgive, in order to keep Kate happy, even though she might never know of his involvement. His selflessness when it comes to Kate is admirable and something I will cling to when he acts with coldness or nonchalance in future books, as a way to keep his heart safe. For such a short read, a lot happens and we learn a lot about the various characters who do make an appearance. While I wouldn’t say that The Goddess Hunt is a necessary read, it’s definitely a worthwhile read for fans of the series, especially if, like me, you’ve been anxious for a peek into Henry’s thoughts!